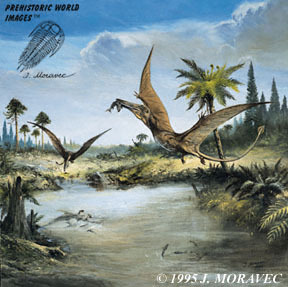 This Rhamphorhynchus art print (1995) was originally a painting by Josef Moravec and is featured in the art collection of Dinosaur Corporation. Josef Moravec is renowned paleo-artist whose paintings have been displayed by Natural History Museums throughout Europe and North America. His work is know for its attention to detail and authenticity. This reproduction of the original oil painting is printed on 17" x 22" super "B" paper. The actual size is 20' x 20'. The Rhamphorhynchus (pronounced "ram-for-ink-uss" and means "beak snout" in Greek) is a genus of long-tailed pterosaurs that lived in the Jurassic period (201 to 0.6 million years ago) and survived for over 30 million years. Their bodies were relatively small compared to some of the other winged dinosaurs. That is, their height ranged from 7 inches to about 1.5 ft. In addition, they are estimated to weigh in at around 11lbs. Furthermore, it is estimated that it took more than three years for the average individual to reach maximum adult size. Despite how large their wings may appear in the Rhamphorhynchus art print at first glance (mostly due to perspective) their wings are estimated to have ranged from 2 to 2.5ft, smaller than some modern birds such as the seagull. These wings are long and thin. A large surface area of skin stretches over its fourth finger. Researchers imagine this species was capable of flight by flapping their wings. Although the Rhamphorhynchus had a long neck and small feet, its body was supported by a large head and it is considered to be one of the first flying vertebrates. Its teeth were located at the base of its jaw. Here, its teeth were sharp and are often described as needle-like, a reference to its angled shape. The beak is curved and had no teeth. Thus, its lack of teeth at the tip of its beak suggests that the Rhamphorhynchus primarily ate fish and insects. It used its "hook" at the end of its lower jaw to catch its prey. Furthermore, it is believed this specimen had a pouch near its throat that was used for storing food. As such, it is speculated that the Rhamphorhynchus would simply find and catch its prey, close its beak shut, and save its prey in its pouch for future consumption. The shape of its tail is contingent on its age. Namely, the vane was shallow and oval-shaped in juveniles and diamond-shaped in adults. Only the largest of specimens had a triangular-shaped tail. Fossil remains have been found in England, Tanzania, Spain, and Germany. The most preserved specimen, however, was found in the Solnhofen limestone of Bavaria, Germany. This limestone contained impressions of the specimen's wing membranes. Lastly, teeth belonging to the Rhamphorhynchus have been found in Portugal.